Hey Coffeeholics! 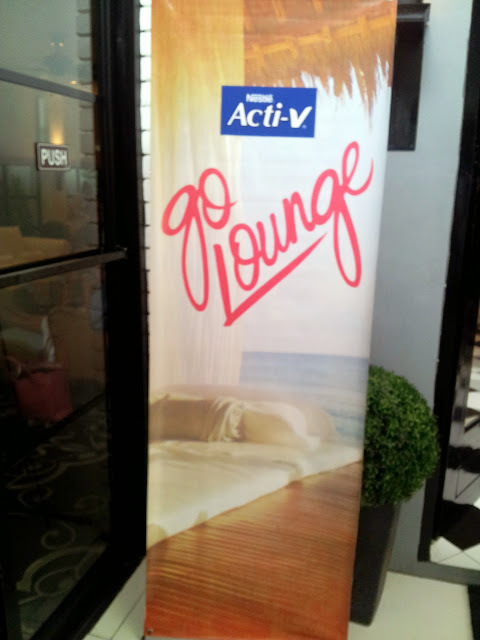 Last Saturday, I had the privilege of attending the Nestle ActiV Go Lounge event many thanks to Nuffnang Philippines. It was held at Romulo Cafe near Tomas Morato and the event really blew me away with its fun and bonggang activities! 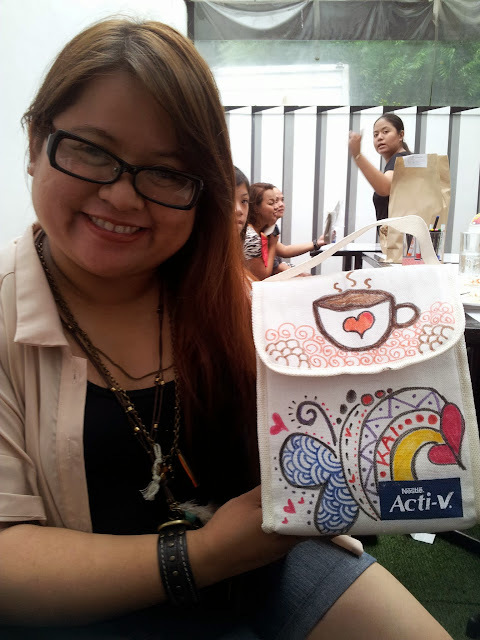 The STAR of the EVENT - NESTLE ACTI-V! I just sooo love the lovely accents they mixed in the whole event! It truly made us feel special. :) Thanks Nestle! Nestle really got us intrigued with this unique event. I love the concept of it being a "Go Lounge" affair which gives us an impression that the event will be fun, relaxing, and enjoyable. After a week of hard work, that sounded heavenly! 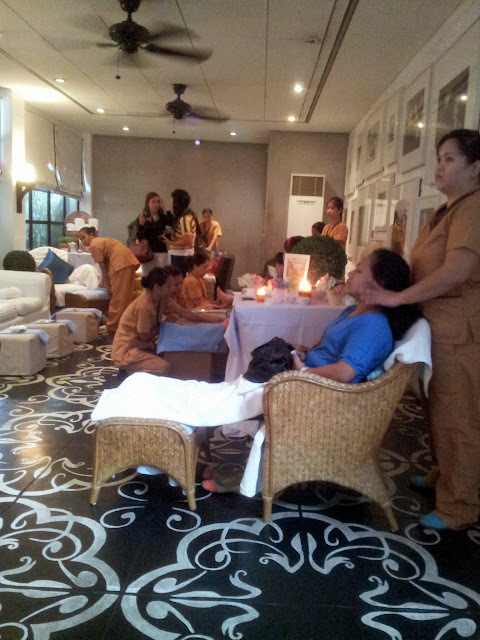 So the first activity that we had was the SPA! Homahgash it was such a treat! 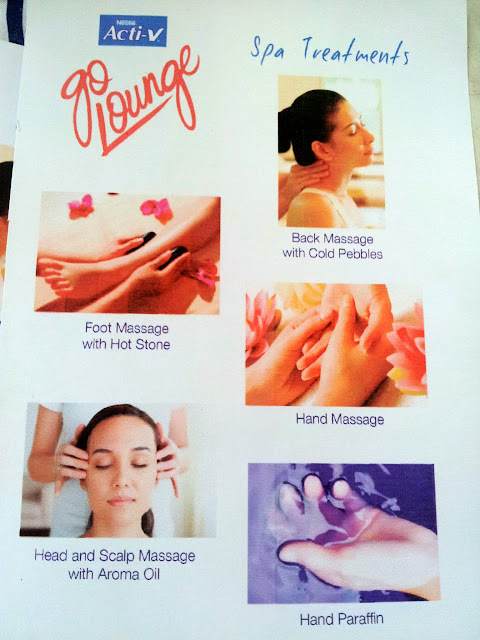 We were given several choices on what type of spa treatment. It all looked nice but I've been longing for a good back/shoulder massage so I decided to get the Back Massage with Cold Pebbles treatment. I'm sooooo loving the pattern of the floor sa Romulo Cafe! 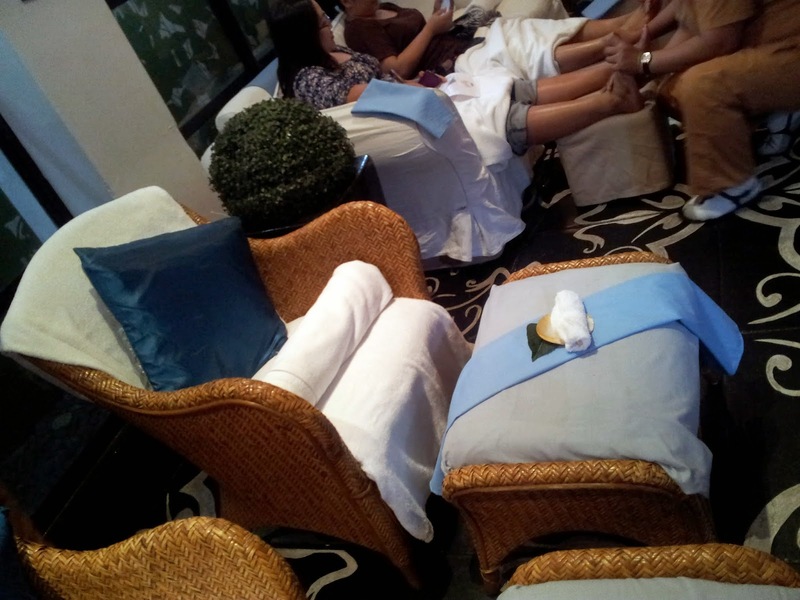 For the back massage, we were treated to a cold pebble massage with a choice of a lavender or peppermint treatment. Kakaintriga! It was my first time to hear such a treatment. 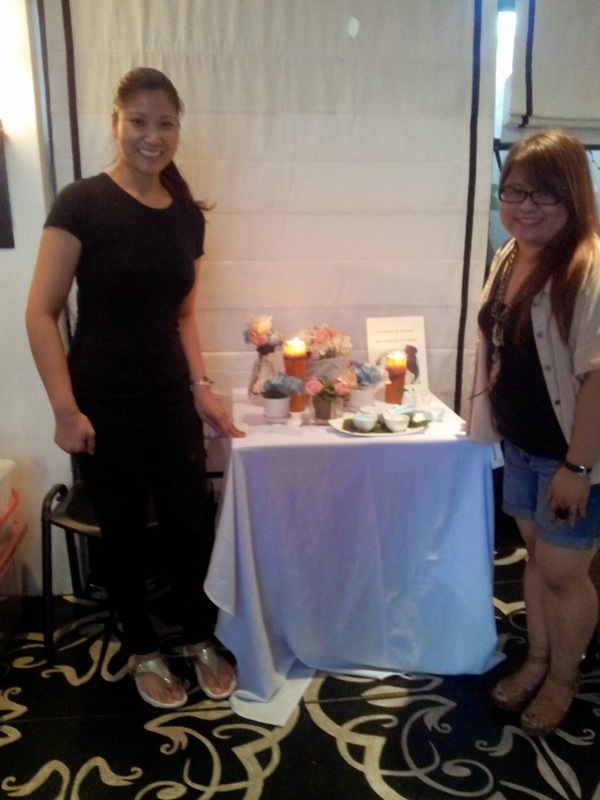 Miss Leah Dy of Tocarre Spa and Fruits in Bloom was kind enough to explain to me that they wanted to give an alternative option to the "hot stone" massage that most of us are more familiar with. She pointed out that sometimes when the weather is too hot, a "hot stone' massage doesn't really appeal to us especially because of our unique climate. So they decided to offer something cool and soothing! I have to agree that this certainly has an appeal especially on a hot scorching day! This is a face of bliss. hehehe. I really LOVED the massage! The cold pebble back massage was a hit among us. Nakakabitin nga eh! Thanks Nestle and Ms Leah Dy. The massage indeed relaxed me and made me eager for the next activity. 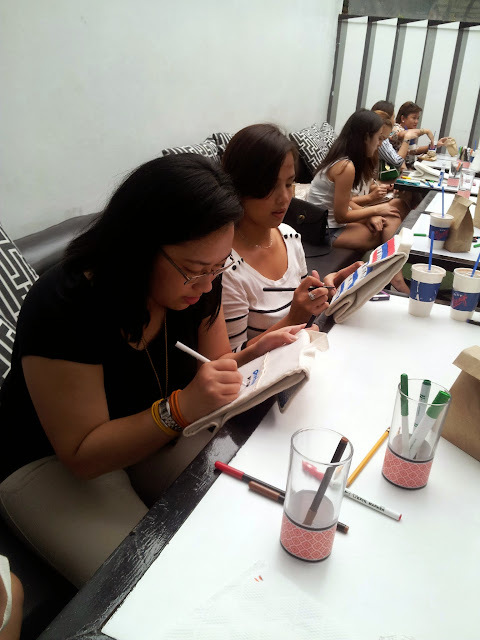 This was the second activity we had for that day - Unleashing the artist in us! 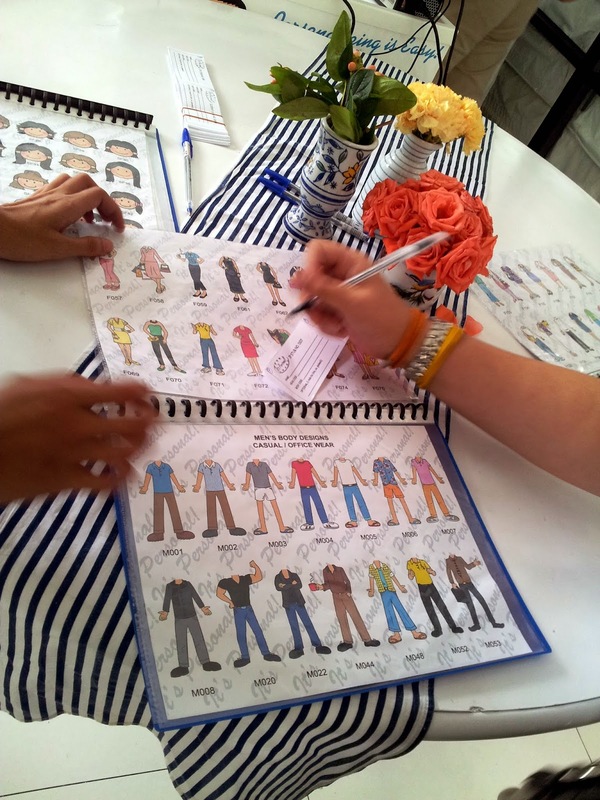 its SHOPGIRL JEN getting creative! 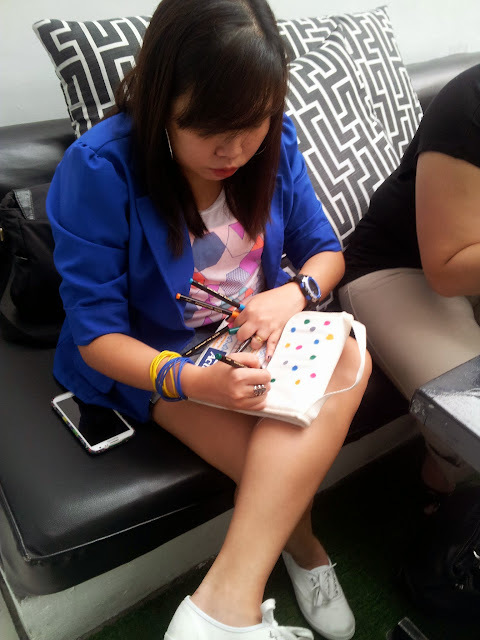 Ohhthat by Tin and Mar engrossed in designing! Ok so I bet you are wondering what the heck were we doing. 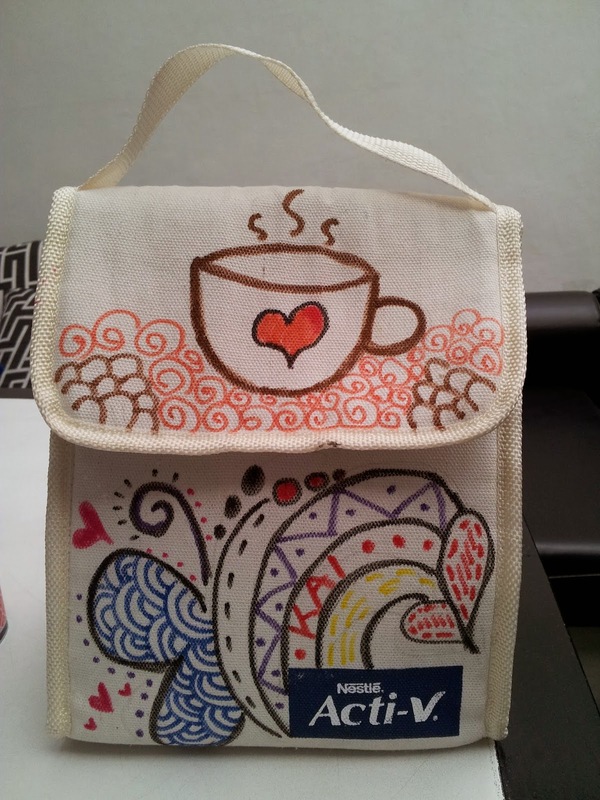 Simply put, we were given a chance to design our very own Nestle Acti-v Canvass Chiller Bag using fabric colored pens. Homahgash I loooooooved it! All the teacher-ness in me went on full drive! 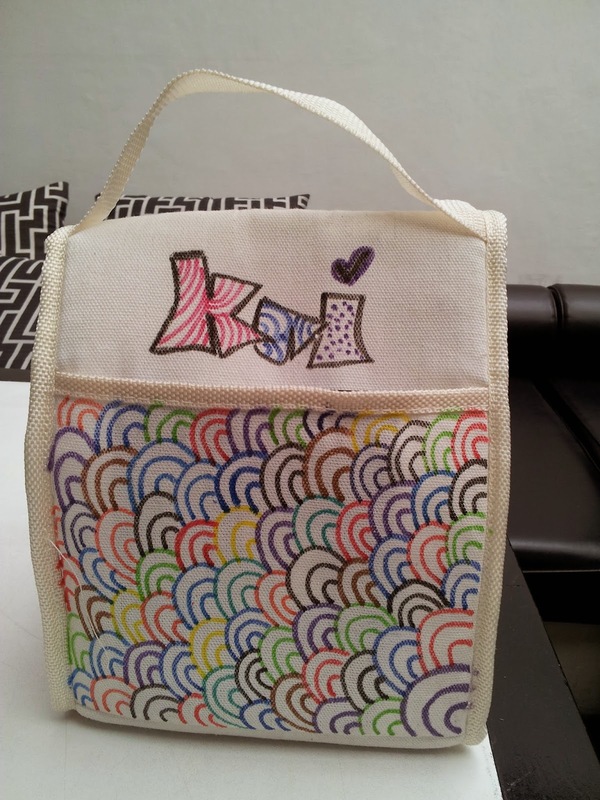 Everyone started designing their own bags. Most were symbolic representing themselves, their blogs, and well we could all go Psych 101 on what we drew and colored but I won't go technical on you. But this activity really clicked for me. I LOVE TO DOODLE. I think I've already posted some of my random doodles on my instagram (shameless plug - follow me @kai_sensei!). Doodling is relaxing! Ask any of my students! 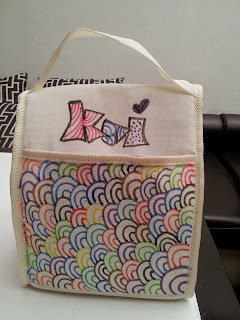 Doodling, drawing, or coloring helps me to relax my mind and just let creativity flow on my fingertips. Obvious bang akin to? HAHA! The coffee is like a dead giveaway! hehe! Coffee, Fashion, and my Blog inspires me to be a better version of me. Chos! I mean yeah, who doesn't want to look a whole lot more better in their Outfit shots? Yeah so I understand why this activity suits right in the "Go Lounge" theme for this Nestle Acti-V event. Actually, we all became a bit more engrossed than necessary and it was the lure of food that finally convinced us to stop our artsy moment. 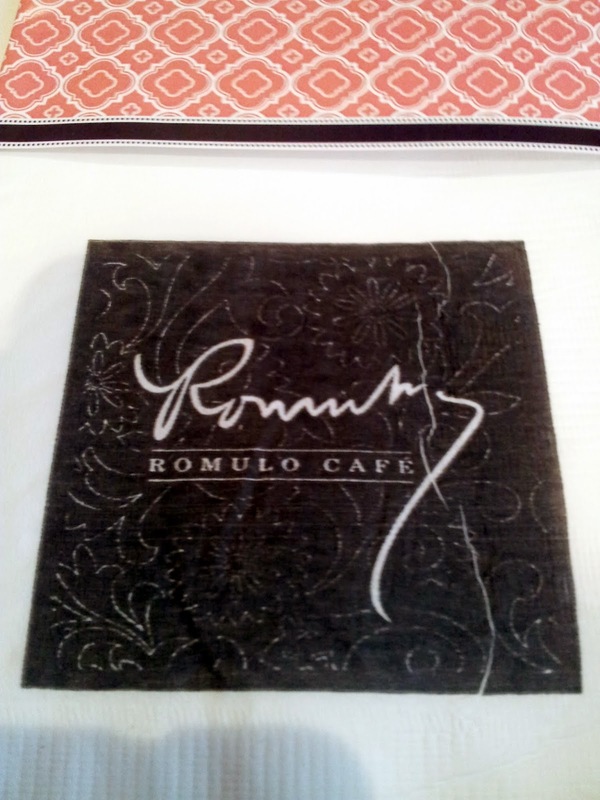 Can't get over the inside decor of Romulo Cafe! We were served with salad, pasta, and other healthy entrees that filled the stomach. It was delicious! 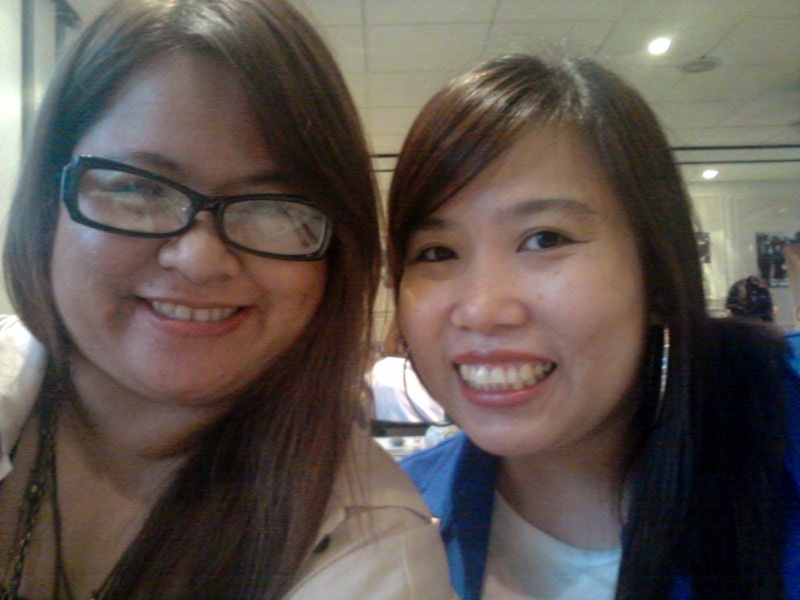 WIth my bff cuz blogger JEN! :) Thanks sa lahat cuz! SAVE THE BEST THE LAST. Of course for dessert, we were given some chilled Nestle Acti-V yogurt as dessert! It tasted DELICOUS and I really loved it! It had just the right amount of tartness combined with the exquisite sweetness of the strawberries. Panalo talaga! Its filling and healthy and I don't feel guilty eating it. (haha may ganun!). Yogurt is actually one of our family's fave healthy snack or dessert. Just last night I had one as a midnight snack. Di na kasi ako nag dinner. (naks! hehe) Not only coz its healthy but because it does wonders to the tummy! Hehe. Yes, digestion problems? Well yogurt is the answer for those lacking in fiber. 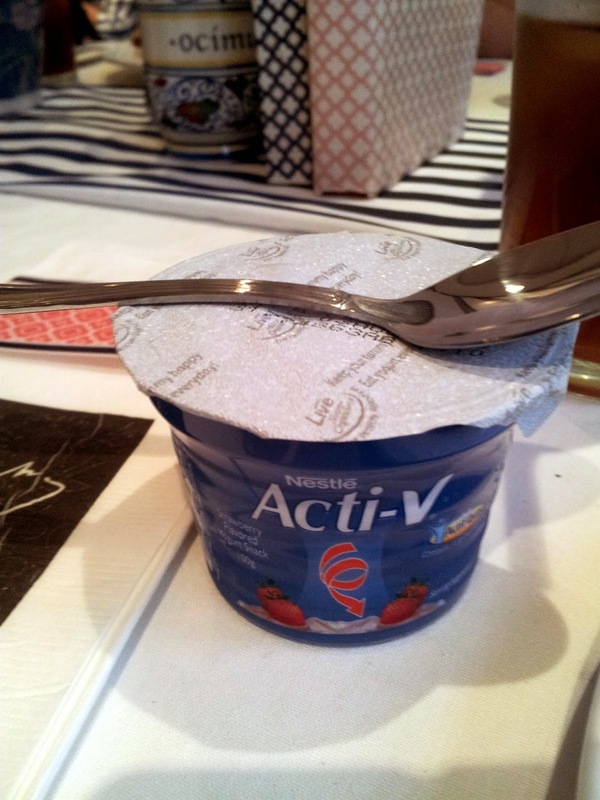 NESTLE's new product, ACTI-V, is the only yogurt that contains fiber. The active fibers called ACTIFIBRAS is not just good for your digestion but also scientifically proven to help regulate bowel movement. What I love about is that it is also super convenient! Just chuck it into the fridge, keep it chilled, and then grab one when you are hungry. Oh diba! 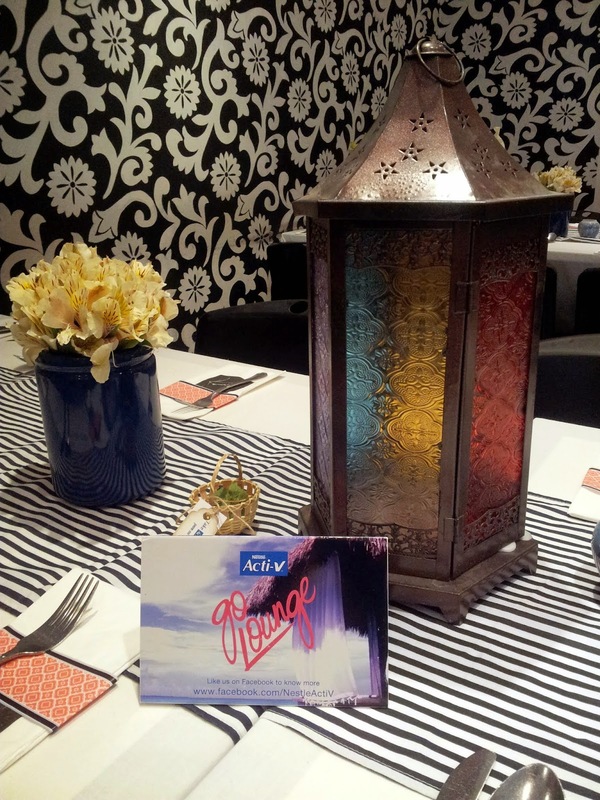 We were then pleasantly joined by the one and only Cherie Gil, Nestle Acti-V's endorser. She looks AWESOME right? She started sharing how exercise, eating the right food, and of course how NESTLE ACTI-V has helped her in maintaining her lovely slim form. She made all of us at ease even with her discussion about constipation - which is a topic we aren't normally so much open about. She shared how Nestle Acti-V truly does wonders for constipation and our digestion because one cup already contains 5 grams of fiber that one can get in one full bowl of salad greens! 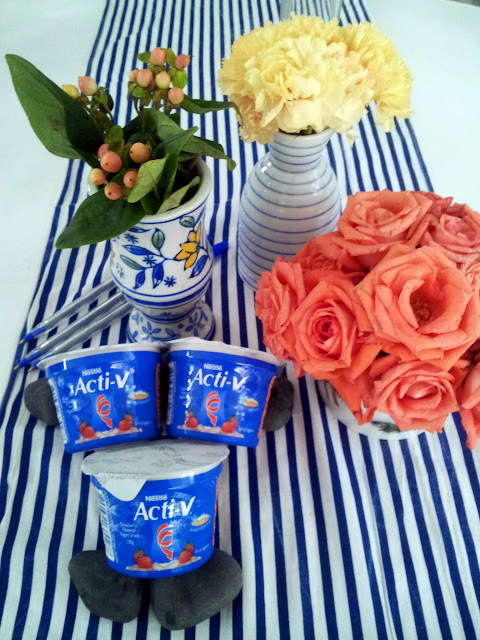 So if you want to get into the healthy lifestyle and not so keen on greens, NESTLE ACTI-V is the fiber for you! This really got me thinking. Looks like I will be stocking up on Nestle Acti-V so that I can seriously get into the body shape that I want! Thank you Nestle! And last but not the least, while waiting for our take home Its Personal! 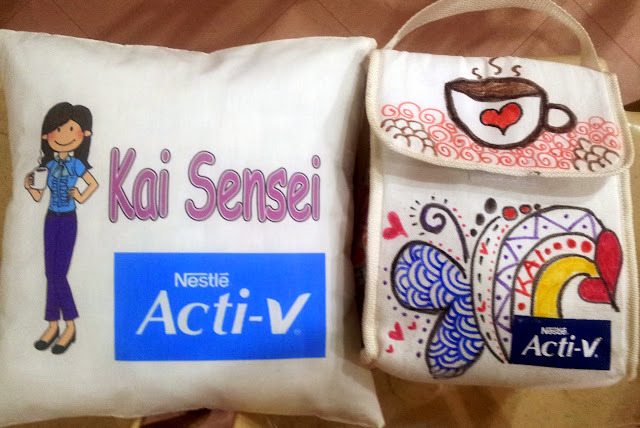 pillow souvenir of this event, we were able to lounge at the 2nd floor of the cafe which was turned into a very inviting and cozy place to hang out and watch short films while drinking our Nestle Yogurt Acti-V Smoothies. Yum Yum! SORRY na po for the blurry photo. It was dark in the room. And yes that was me taking the photo kaya wala ako sa pic! haha! From L-R, Jen, Vance, Vance's Mom, and Tin! Oh diba sosyal! May bed pa! Super tempting to lie down, relax, and take a nap? haha! We resisted the urge but totally loved the relaxing setup. Super enjoyed the short films we watched! You all should watch "POST IT LOVE" at youtube. It was one of my favorites! 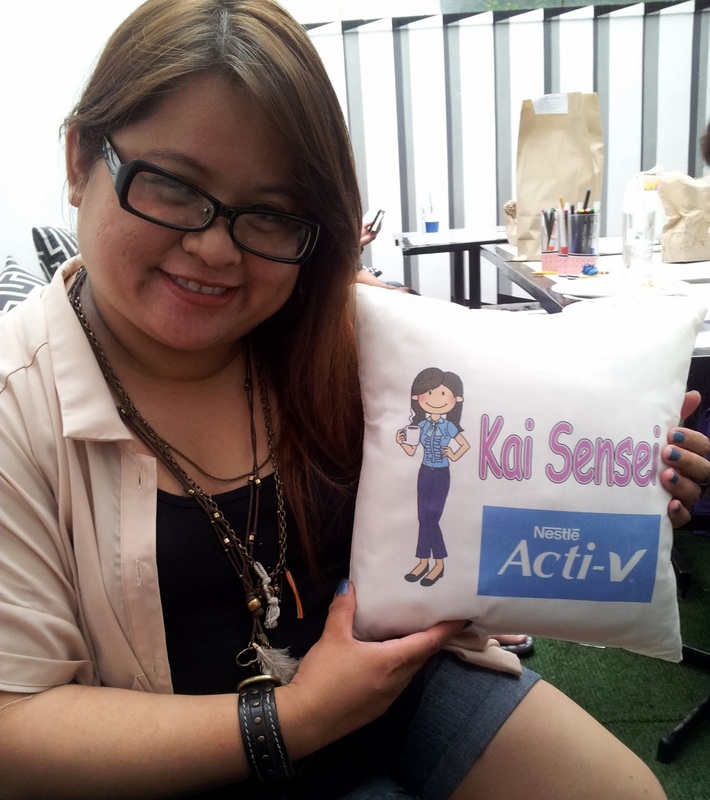 So just before the whole event started, we were asked to fill up a form and personalize our cartoon selves for our souvenir pillow! Wow super love love! I chose my cartoon persona to represent me talaga. Oh diba? Akong ako! 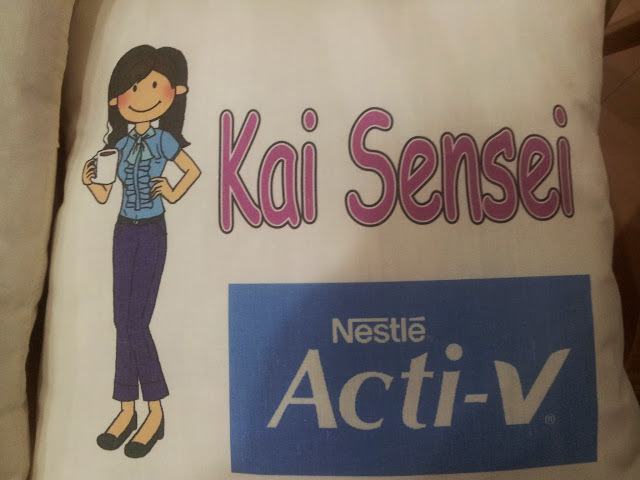 In the Nestle Acti-V world, this is me! haha! Its purple, has a coffee mug, and looks like a teacher. hahaha! LOVE IT! Its now on my bed and inspires me to aim for a healthier and slimmer version of myself. Naks! Thank you so much NESTLE and NUFFNANG PHILIPPINES for this wonderful experience.